ITAM and ITSM add value to the organization independently of each other, however, by aligning and combining people, processes, data and tools, the maturity and value of both programs can be greatly enhanced. Through the sharing of capabilities and data and the establishment of a seamless flow of IT processes across both disciplines, IT organizations can break down silo walls and cultivate collaboration between ITSM and ITAM – driving greater productivity, efficiency and transparency. 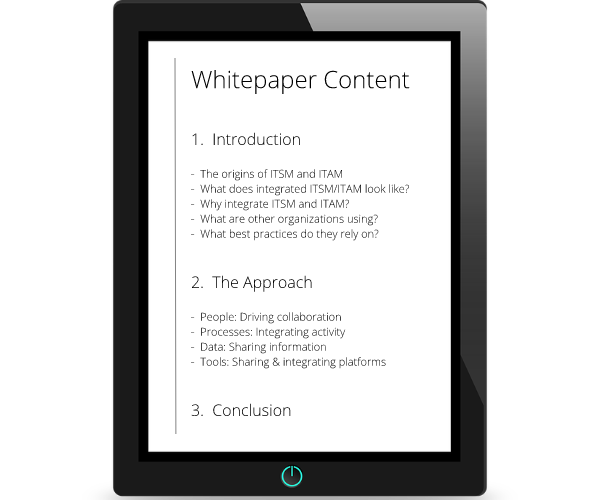 This whitepaper by Axios describes the steps involved in integrating ITSM with ITAM – looking at the people, process, data and technology aspects that must be considered to succeed.